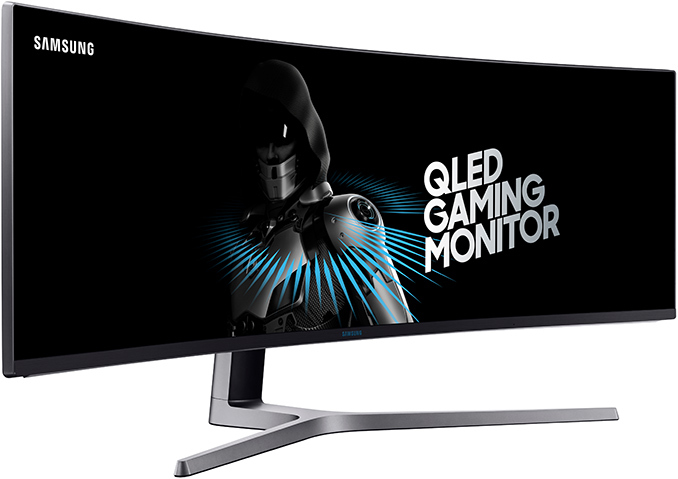 Samsung on Friday announced the C49HG90 monitor, their new flagship gaming monitor that includes virtually all of the major gaming-oriented display technologies available today. The new 49” screen has a an ultra-wide 32:9 aspect ratio, a 144 Hz refresh rate, and uses quantum dot nanocrystals to enable support for DCI-P3 color gamut, and, perhaps most importantly, it supports AMD’s forthcoming FreeSync 2 technology. In addition, Samsung introduced its CHG70-series displays that will support the same technologies, but will be smaller and more affordable. The Samsung C49HG90 is the company’s first ultra-wide display with the 32:9 aspect ratio and the so-called double full HD (DFHD) resolution (3840×1080). The monitor is based on a VA panel with up to 600 nits brightness, 1 ms moving picture response time (MPRT) as well as a 144 Hz refresh rate, two features important for fast-moving games. The panel has 1800R curvature along with 178° viewing angles to make gaming experience more immersive. The smaller C32HG70 and C27HG70 monitors use 32” and 27” curved VA panels (respectively) with a 2560×1440 resolution as well as the same refresh rate and MPRT as on the flagship model. Large dimensions, curvature and a high refresh rate are not the only distinctive features of Samsung’s new breed of gaming displays. The C49HG90 features LED backlighting enhanced with quantum dots that enable support for the DCI-P3 color space (as well as larger-than-sRGB gamut) and the HDR-focused AMD’s FreeSync 2. Samsung claims that the QLED backlighting of the display is similar to that used in its high-end UHDTVs with HDR, but does not say anything about features like local dimming or formal support for the HDR10 spec. Keeping in mind that Samsung’s announcement is focused around games and FreeSync 2 (and the latter uses its own HDR transport) the status of the HDR10 support isn't known at this time. Meanwhile, Samsung’s HDR implementation makes the CHG70- and the CHG90-series displays the first to support AMD’s FreeSync 2, which is something bigger than just a new dynamic refresh rate technology (as discussed in the appropriate article). 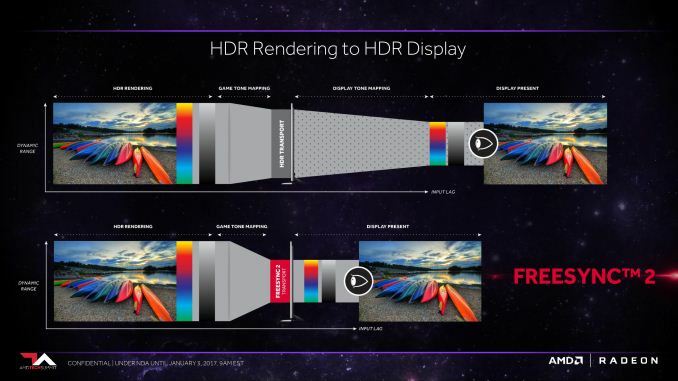 The FreeSync 2 mandates support for Low Framerate Compensation – an optional feature for FreeSync 1 monitors – but the biggest shift from a feature perspective is how HDR works. Rather than double-tone mapping the dynamic range – tone mapping a game once from its rendering space to HDR10's space, and then again in the monitor from HDR10 to the monitor's native space – FreeSync 2 skips the middle-man by having games tone map directly to a monitor's native dynamic range. This saves potentially precious milliseconds both by removing a step, and by putting the extremely fast GPU in charge of the process instead of the historically inconsistent display processors inside monitors. As this is the first FreeSync 2-related news to hit the scene in nearly 5 months, there are some remaining questions that at least as of Samsung's announcement have not yet been answered. Chiefly, when AMD will enable FreeSync 2 support on their end, as all of the heavy lifting is being done by AMD's drivers. Coupled with that is a need for FreeSync 2-enabled software – since devs need to code for it – so that there's something to use with the display. Samsung says that it had collaborated with DICE and Ghost Games to enable HDR in the upcoming Star Wars Battlefront II and Need for Speed Payback games, which may indicate that these two titles will be among the first to support AMD’s FreeSync 2. 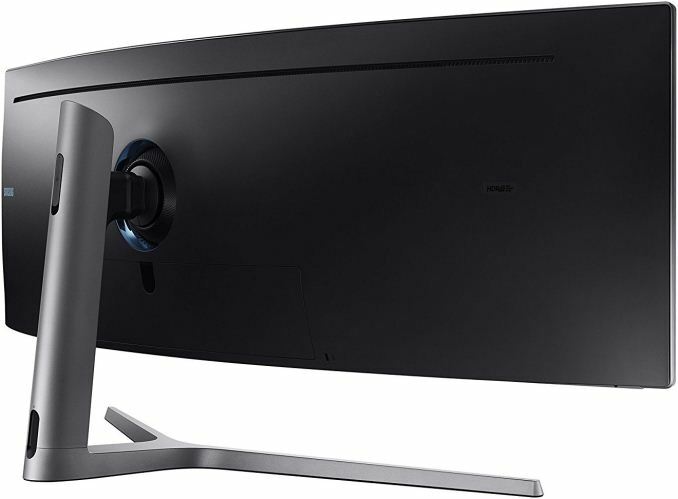 Samsung plans to demonstrate its CHG70- and the CHG90-series monitors in action at the Ubisoft booth at the E3 convention this week, just a couple of weeks before the devices will hit the market. This in turn implies that this Ubisoft is also set to support AMD’s FreeSync 2 (good news for the GPU developer) in at least some of its titles, but this is a speculation for now. While the C27HG70 and C32HG70 look like rather regular gaming displays with a high refresh rate and FreeSync 2, HDR and DCI-P3 support as important bonuses, the C49HG90 seems like an experimental model that will compete against multi-monitor setups. Consumer displays with the 21:9 aspect ratio have been available for several years now and are gaining traction, but so far, no monitor manufacturer has attempted to offer a very large monitor with the 32:9 aspect ratio and a relatively low DPI. People buying the C49HG90 will not be able to watch 4K content on them in native resolution and that may stop some gamers from adopting it. On the other hand, those who use multi-display setups for ultra-wide screen gaming today do not necessarily enjoy 4K video anyway. The Samsung C49HG90 will be available in late June at a price of $1499. The monitor is now available for pre-order at Amazon and Micro Center in the U.S. 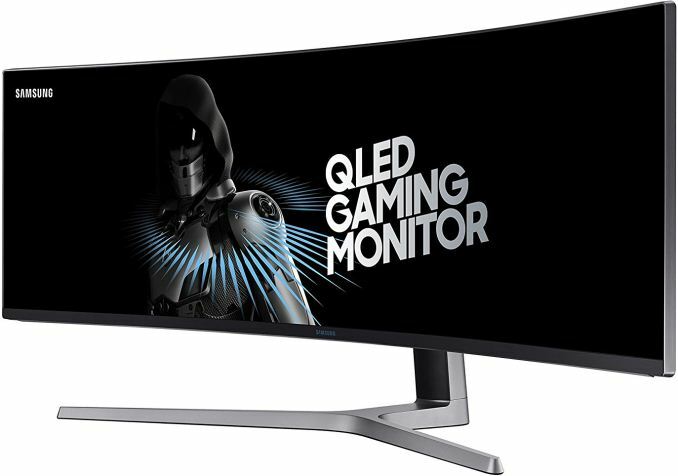 The 32” C32HG70 will cost $699 and is available for pre-order at Newegg, whereas the 27” C27HG70 will be priced at $599 and can be pre-ordered from Samsung now.